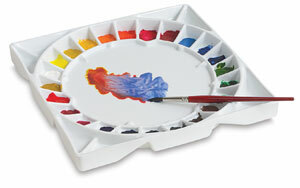 Find out what watercolor painting supplies you'll need to begin painting with watercolors! If you can't wait to get started with watercolor painting, be sure to read the info on this page so you know exactly what to buy. The great news is that you actually don't need that many supplies to get started with watercolors. This makes watercoloring an affordable pastime. Even if you just have a beginner's set, you can still make some beautiful art! 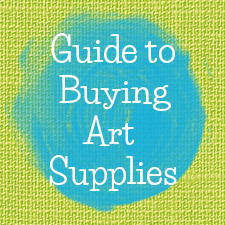 I've divided this page into 2 lists: one for essential watercolor painting supplies, and one for extra watercolor supplies. If you are a beginner at watercolor painting, then be sure to get everything that is mentioned in the Essential Watercolor Painting Supplies list. These are the things you really cannot do watercolor painting without. Even if you are a beginner, take a look at the items on the Extra Watercolor Painting Supplies list, because there are items there that can be really handy for watercolor painting, but aren't totally necessary. A few of them you will already have on hand, such as paper towels, a pencil, and an eraser. But you don't need to buy the other supplies unless you feel ready. That's why they are "extra"! To get started with watercolor painting, you will need these 6 essential watercolor painting supplies: paints, paintbrushes, watercolor paper, a palette, a container of water, and soap. Watercolors come in 2 forms: tubes and pans. Tubes of watercolors are already moist, with a pasty consistency. Pans of watercolors are like hard cakes of paint that need to be moistened with water to be used. If you're not sure whether to get pans or tubes, consider buying a beginner's set of each and seeing which you like best. Every artist has his or her own preference on pans vs. tubes, so it really boils down to your own experience with each! 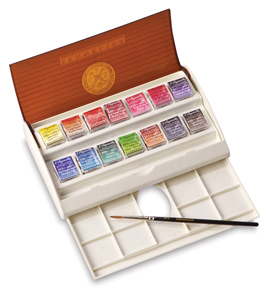 Watercolor paints are available in sets, or you can purchase them individually. 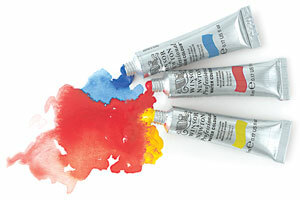 Watercolor paints are also available in 2 types of quality: Artist Quality and Student Quality. The Student Quality watercolors are more affordable, but they contain more filler and less pigment than their Artist Quality counterparts. You basically get what you pay for. With Artist Quality watercolors, you can achieve more subtleties with color and transparency. Still, Student Quality watercolors will give beginners a taste of what it's like to work with watercolors - and if you find that you like it, then you can always invest in a set of Artist Quality watercolors down the road! Natural brushes are better than synthetics, and if you can only afford one brush, choose a natural round brush. If you can afford two brushes, get a small round and a medium round (or a medium round and a large round, depending on whether you like to work big or small). This is all you need to get started - you can worry about the other sizes and shapes later! 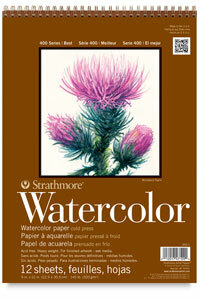 If you're on a budget, you'll be happy to know that you can create an entire watercolor painting using just one brush! I've done this quite a few times, using just a small round brush. Hair - Natural hair paintbrushes are the best choice for painting with watercolors, but they can also be costly. Sable hair is the most revered, especially Kolinsky Sable. The hairs are strong and when well-cared for, Kolinsky Sable brushes can last a lifetime. Red sable and pure sable paintbrushes are less expensive than Kolinsky Sable, but still quite good. Other types of hair used to create watercolor brushes include ox hair, which is ideal for square brushes; squirrel hair, which is ideal for mop brushes; and goat hair, which is ideal for creating large washes. If you are on a budget, there are some good synthetic brushes you can try that work well with watercolors. With the right care they can last a long time, but will likely not last a lifetime like a quality natural hair paintbrush. Synthetic brushes may need to be replaced every few years or sooner, depending on how often they are used and how they are treated. 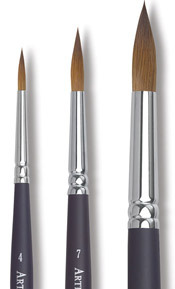 Size - Watercolor brushes come in sizes ranging from super-tiny to somewhat large. A range of sizes is nice, but you don't need that many, because watercolor brushes are so versatile (as you'll see from the descriptions of each brush shape described below). A medium or large round brush, for example, is sufficient for creating both large washes of color and for creating fine details, so you can use the same brush for both functions. Angular - The hairs are cut at an angle (hence the name). 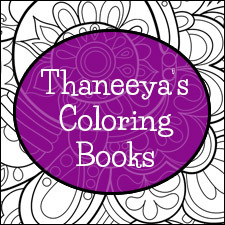 Can be used for precise strokes but also can be used to fill medium-large blocks of color. Flat - Can hold lots of color. The edge can be used for sharp lines, but the brush can also be used to fill in broad areas with color. Square Wash - Looks like a short, stumpy version of the flat brush. Ideal for wetting the paper or laying in washes. Mop - Great for wetting your paper and laying in large areas of color quickly. Oval Wash - These brushes look kind of puffy, like a make-up brush. Used for wetting paper and laying large washes of color quickly. These brushes never form a point or an edge. Script / Liner - Pointy, narrow brush for executing fine details. 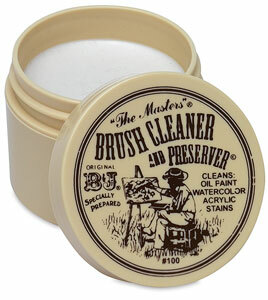 Round - The best "all-around" brush – you must have a round brush in your box of watercolor painting supplies! The round brush can be used for both details and washes. You can change the width of your lines by varying your angle and pressure. To help fund this site, I receive a small commission from purchases made via the links below. Watercolor Papers are available as sheets, pads, or blocks. There are Student Papers and Artist Papers, and again, you get what you pay for. Artist papers will be better quality, which will allow you to achieve better results. Sheets - Artist Quality watercolor papers can be purchased in individual sheets that you can cut to size. This is a good way to try out different types of paper. 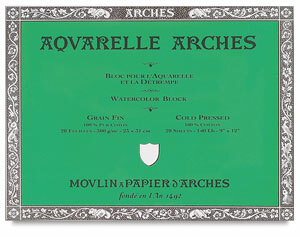 Pads - Most watercolor pads contain Student Quality watercolor paper that is connected on one edge by a wire binding. 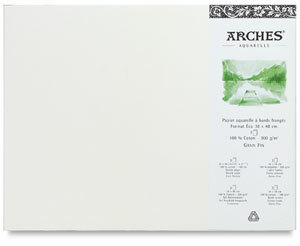 Watercolor pads usually contain 10-20 sheets that are much smaller than what you can purchase individually. Pads are great for travel and also handy for practice! Blocks - Watercolor blocks are basically a pile of watercolor papers that are glued together on one edge. You paint on the top sheet and then after the painting has dried, you insert a knife into the glued binding and gently remove your page. The benefit of painting on watercolor blocks is that you don't need to stretch your paper, which we'll talk about later. There's one more thing you should know about watercolor papers: they are available as hot-pressed, cold-pressed, or rough. Most watercolorists use rough or cold-pressed paper. Most watercolor palettes are either plastic or ceramic. Ceramic palettes are better quality; the plastic palettes will eventually become stained with the paint, but plastic palettes are lighter and easier to hold. Choose a palette that has separate wells that you can mix your colors in. The walls of the wells will keep the colors separate, otherwise the watery paint may just run into each other. 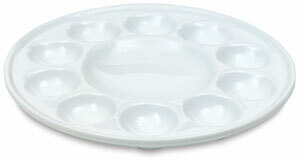 If you use pan watercolors, you can also use the plastic lid of the watercolor set as a palette. Just be sure that the lid is dry when you close it. In a pinch, you can use tin foil or a dinner plate as a palette. Just be sure to space the colors far enough apart that they don't run into each other! A glass, jar or cup of water is essential. It's best if your container is clear, so that you can see how clean or dirty the water is. It's important to change the water when it becomes too murky; otherwise the residue can get onto your brush and wind up on your painting. Some artists use 2 containers of water – one full of clean water for dipping, and one for rinsing in between colors. To clean your watercolor brushes, use a mild shampoo or organic, all-natural soap. 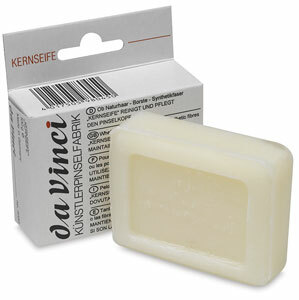 Avoid commercial soaps with strong cleansers, as they can damage the hairs of your brush. Phew! Congratulations, you've just gotten through the list of Essential Watercolor Painting Supplies! Paper towels - Handy for squeezing out excess paint and water from your brush, and also for dabbing at mistakes. Pencil - If you want to sketch in your composition before painting, use a pencil. The lighter, the better! Choose something like a 2H over an HB or 2B, for example. Eraser - Use an eraser to erase those pencil marks if you make a mistake or if they get too dark! I prefer a kneaded rubber because you can mold it to any shape you need. Board - Depending on how your studio is set up, you may need to attach your watercolor paper to a board. 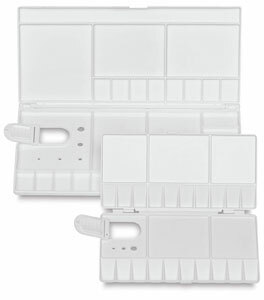 Clips - Clips can be used to attach your watercolor paper to your board. Tape - You can also tape your watercolor paper to your board, using an acid-free artist tape. Tape can also be used as a mask. Ruler - A ruler is handy for measuring and marking the boundaries of your paper, as well as aiding with any straight lines you may need. Mediums - There are a whole range of watercolor mediums that can alter the characteristics of watercolors, for instance by extending the drying time or increasing transparency. When you're just starting out, it's best to get used to watercolors as they are - so if you are a beginner, you can safely ignore these mediums for now! Masking Fluid - is used to "mask" certain areas of your painting. If you're a beginner, you also don't need to use masking fluid right away (if ever), so you can also safely overlook this "extra" watercolor supply for now! Spray varnish - When your painting is finished, a spray varnish can protect your watercolor painting by making it waterproof. Some spray varnishes also carry UV protectants. So there you have it – your list of essential and extra watercolor painting supplies! 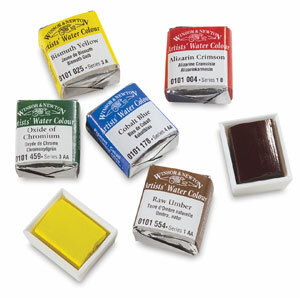 If you're not sure what to get, take your time and read more about the different watercolor painting supplies. 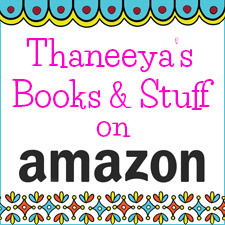 Read product reviews to see what other artists are saying about specific products and brands. And remember, you can always start out with affordable watercolor painting supplies and upgrade as you become more comfortable with the medium. You don’t need to shell out $400 for a top-grade Kolinsky Sable brush (like the one below!) if you're just starting out… Just ease into it with moderately-priced watercolor painting supplies, and you'll be fine! 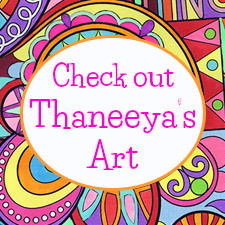 Learn how to create an abstract watercolor painting! See how to combine watercolors and colored pencils in this fun mixed media tutorial! Read an overview of painting with watercolors.